The results of European Bioplastics annual market data update, presented recently at the 9th European Bioplastics Conference in Brussels, confirm the positive growth trend of the global bioplastics production capacities. The market is predicted to grow by more than 400% in the mid-term, stated Fran ois de Bie, Chairman of European Bioplastics. 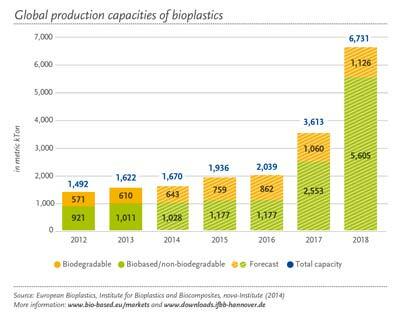 The data compiled in cooperation with its respected scientific partners the IfBB - Institute for Bioplastics and Biocomposites (University of Applied Sciences and Arts Hannover, Germany) and the nova-Institute (H rth, Germany) shows that bioplastics production capacity is set to increase from around 1.6 million tonnes in 2013 to approximately 6.7 million tonnes by 2018. Biobased, non-biodegradable plastics, such as biobased PE and biobased PET, are gaining the most. PLA is a major growth driver in the field of biobased and biodegradable plastics. Furthermore, renewable and compostable plastics produced locally are likely to benefit from the new EU directive on the reduction of shopping bags. Flexible and rigid packaging remains by far the leading application field for bioplastics. Besides this, a decisive growth can be observed in textiles and automotive applications. From functional sports garments with enhanced breathability to fuel lines bioplastics are constantly spreading into new markets, explained de Bie. With a view to regional capacity development, Asia will expand its role as major production hub. Most of the currently planned projects are being implemented in Thailand, India and China. About 75% of bioplastics will be produced in Asia by 2018. In comparison, while Europe at the forefront of research and development will be left with only roughly 8% of the production capacities. Additionally, other regions of the world, such as the US and Asia, invest into measures closer to market introduction , which results in a faster market development than in Europe. "We urge the EU legislators to consider and make efficient use of the immense environmental, economic growth and job creation potential of our industry. In this context, the Circular Economy Package should remain in the Commission s 2015 Work Programme and the Waste Target Review should proceed as planned," concluded de Bie.